Clancy & Theys has effectively responded to the dramatic expansion of LEED® and green construction, earning a spot in the nation’s top 100 largest green contractors by Engineering News-Record. Our first LEED projects –both in 2005 – were Rubenstein Hall at Duke University and Carrington Hall at the University of North Carolina at Chapel Hill. Since then, we’ve completed projects earning Platinum, Gold and Silver LEED status. Most recently, two projects Clancy & Theys completed for the State of North Carolina received LEED recognition. 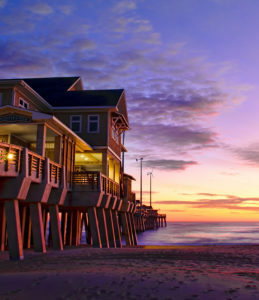 Both Jennette’s Pier in Nags Head and the Nature Research Center in Raleigh earned LEED Platinum status. Our sustainability goal is always to gain and maintain LEED points to help our clients reach their own sustainability goals. We provide cost menus and value assessments of LEED strategies, deliver comprehensive LEED administration and waste recycling during construction, and provide subcontractors with specific LEED requirements and templates in our bid packages. Currently, we have numerous LEED projects under construction or awaiting certification. To view some of our sustainable projects please click here.